After taking a summer break (other than posting daily reminders of important things on the Just Keep Pouring Facebook page), Just Keep Pouring is back at it. School started yesterday in Orange County, Florida and other places across the US. It’s a new beginning for millions of children around the country. The term “New Beginning” seems redundant. Every beginning is new. It’s fresh. It’s clean. It’s not colored by anything other than what resides between the ears of the individual. But while the term appears redundant, perhaps both words are appropriate to add emphasis and importance. Beginnings are special and should be treasured. Every day presents a new beginning. Every week presents a new beginning. Every month presents a new beginning. Every new experience presents an opportunity to learn. Of course certain beginnings carry more significance than others and become turning points. Something important happens that triggers a change. The individual, or group of individuals, respond in a way that’s new and unique. New habits emerge. And change happens. Most new beginnings are wasted. Either the individual hasn’t thought enough about what they want in order to drive change. So a new day is just another day. Or the end goal isn’t important enough, so there may be early progress followed by settling back into old habits. Or perhaps a challenge presents itself and is viewed as insurmountable. Most parents haven’t taken the time to do what THEY need to achieve THEIR dreams, or have been unable to overcome challenges they’ve faced. To expect their children to inherently know what it takes to achieve THEIR dreams is counterintuitive – particularly in light of the challenging environment of distraction society offers children. That is especially true with children we’ve termed “disadvantaged” because their parents or caregivers are focused on survival – the very base of Maslow’s Heirarchy of Needs. Who has time to dream when you’re trying to kick a drug habit or find money to keep the lights on? Just Keep Pouring worked with the middle school and high school kids attending New Image Youth Center each Monday in July on a goal setting program called Achieve Your Dream! The premise of the program is to help kids achieve ANYTHING in the world they want. They only need to do three things. First, SET A GOAL. Second, MAKE A PLAN. Third, EXECUTE THE PLAN. And while it’s incredibly simple, it isn’t easy. The fourth element is understanding how to overcome the unavoidable challenges that appear – some we seek, and some show up without invitation. Dealing with challenges involves (1) knowing your enemies (your enemies CANNOT be people) and exactly how you’ll defeat those enemies; and (2) knowing your team (and your team needs to include people), how that team can help you, and how you’ll draft that team. 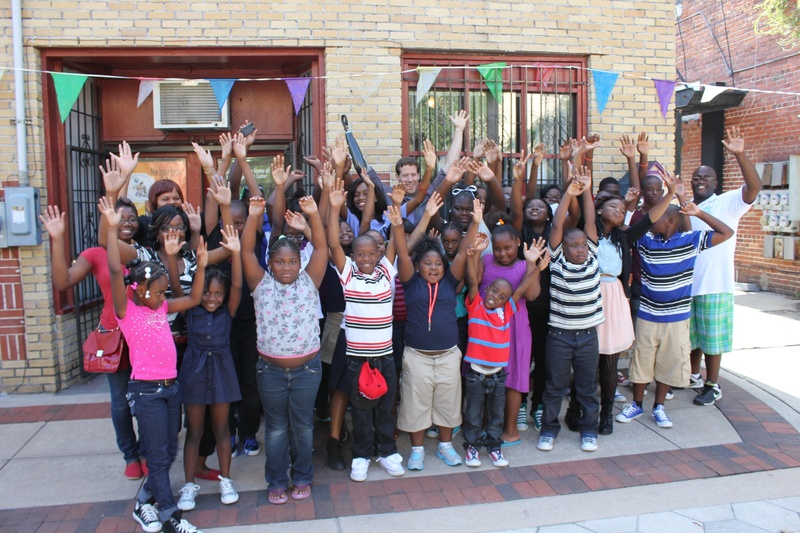 A friend of Just Keep Pouring, Aron Ralston, met with the kids of New Image Youth Center and had an immediate impact. His message focused on overcoming challenges and the importance of a positive attitude. Who better to discuss dealing with challenges than a man who was trapped by a boulder in a canyon for six days and had to cut off his own arm to survive? Aron connects incredibly well with individuals as he shares the story of his struggle, survival and ultimate success when speaking to large audiences on stages around the world. With the middle school and high school students at New Image, he connected with the kids personally and told his story in the context of the Achieve Your Dream! program – understanding that the boulder was his enemy, and explaining how he turned that enemy into a member of his team. He brought the conversation down a level with the elementary school kids who had several questions about his arm, his prosthetic, how he buttons his shirt, if he can drive, and all the other important questions you’d expect. He spoke to them by name, and made a real impact in the short time he had. The kids were definitely impressed. As Aron’s car rolled away, one of the younger kids yelled, “ARON, YOU’RE MY HERO!” And they were all happy to have a new member of their team. Because once you visit Shanta Stubbs and the kids of New Image Youth Center and see the amazing things they’re doing in the roughest neighborhood in Orlando with contagious smiles and energy, you never forget them. They serve as an inspiration to everyone. Thank you, Aron and Shanta, for all you’ve done, all you did yesterday, and all you continue to do.